Escape to the Emerald Coast city of Destin, home to white-sand beaches and world-famous fishing. Walk 10 minutes to the beach or drive 3 minutes to Henderson Beach State Park from this 2-bedroom, 2-bath vacation rental condo, centrally located in the desirable Palms of Destin Resort. With room for 6, 9th-floor views of the Gulf and access to a lagoon pool, this property has everything you’ll need to experience the “world’s luckiest fishing village” at its finest! 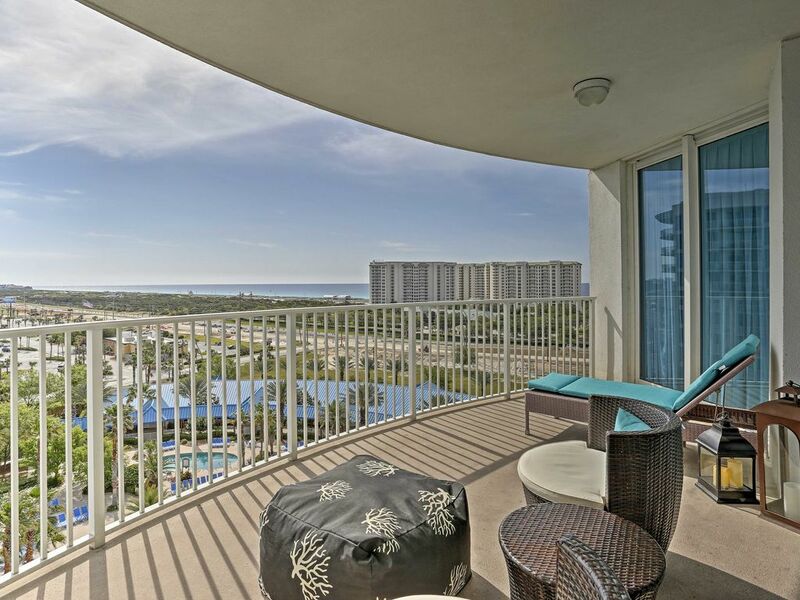 Perched on the 9th floor, this condo offers numerous perks including Gulf Coast views from almost every room and a private viewing deck. Sit back, relax and enjoy the scenery from the comfortable outdoor lounge area overlooking the ocean and resort, or head down to the lagoon pool for a closer look at the abundant amenities of The Palms of Destin. Beat the heat and retreat indoors to cool off under the ceiling fan in the living area. Nautical accents and artwork bring the condo’s seaside setting indoors, urging you to embrace the laid-back lifestyle of the Sunshine State. Surf the channels on the flat-screen cable TV or curl up on the couch for a midday siesta. When you’re feeling hungry, satisfy your cravings at one of the many nearby eateries, or prepare a family favorite right here in the fully equipped kitchen. Serve your home-cooked classic at the dining table set for 4 or savor it al fresco on the balcony. Rinse off any leftover sunscreen in the master en-suite bathroom, featuring a sizable walk-in shower, before curling up in the king-sized bed. Close the curtains to sleep in and, when you’re ready to get the morning started, open the sliding door to kickoff your day with a cool sea breeze on the balcony. Known as the “world’s luckiest fishing village,” Destin invites fishermen from across the country to test its emerald-hued waters. Get out on the water with any one of the top-notch charter services along Destin Harbor while your loved ones enjoy the perks of The Palms like the lagoon pool. What’s a trip to the Gulf without a day on the beach? Head into Henderson Beach State Park less than a mile away to discover over 6,000 feet of scenic, white-sand shoreline along the Emerald Coast. If you’re in the mood to shop, check out Destin Commons less than 3 miles away, or drive a little further out to browse the shops at the Silver Sands Premium Outlets. Give your chef elect the night off and try one of the five-star restaurants nearby. Visit The Back Porch to enjoy a fish sandwich with your toes in the sand or try the Cajun-inspired bites at 790 on the Gulf Restaurant. because when you realize there isn’t any more toilet paper it’s usually at a very inconvenient time. Overall, great place. Owners were very helpful. We would definitely stay here again. Enjoyed our stay and love the view! Just fyi linen for the pull out sofa would be great as well as extra pillow cases. Everything was very nice. I have no compliants. I would definitely recommend this to anyone because you will not be disappointed at all. I was here for my wedding and I couldn’t ask for a better stay just wish it could had been longer. Owner needs to be aware we saw everal huge roaches in the condo . I think they are, coming from under the washing machine. Sofa and chair need new foam. "We have reached out to our pest control service and have had our condo inspected and treated thoroughly. We appreciate our wonderful guests, and we will do whatever is necessary to make them feel at home!"